It's out! It is finally out! 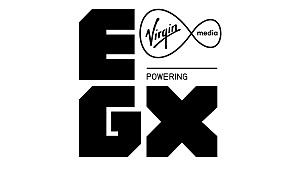 I played a demo of Sumo Digital's Snake Pass at last year's EGX event in Birmingham, England, and again at EGX Rezzed 2017 -- and I've been eagerly awaiting its general release since. 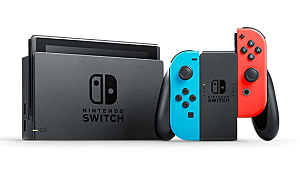 It was released on March 28 for North America and on March 29 for Europe and Australia, and it is available on PC (via Steam), Xbox One, PS4, and the Nintendo Switch. 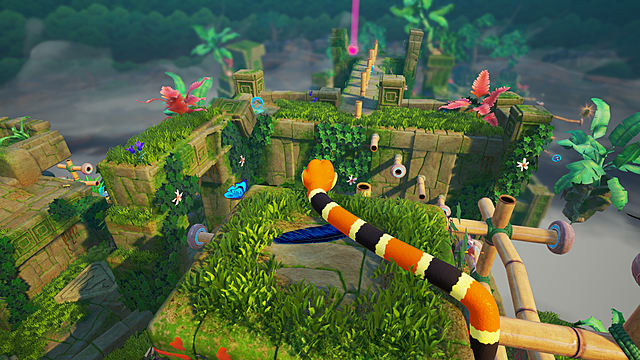 Snake Pass is a delightful 3D platform puzzler in which you must guide the snake Noodle and his hummingbird companion Doodle around various locations while collecting gate gems to progress to the game's next levels. 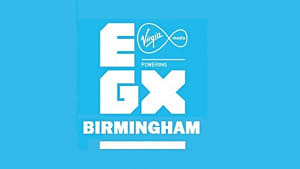 That's the main aim anyway, as there are other collectibles to find for bonuses and more. But these tend to be harder to find -- and even harder to get to. 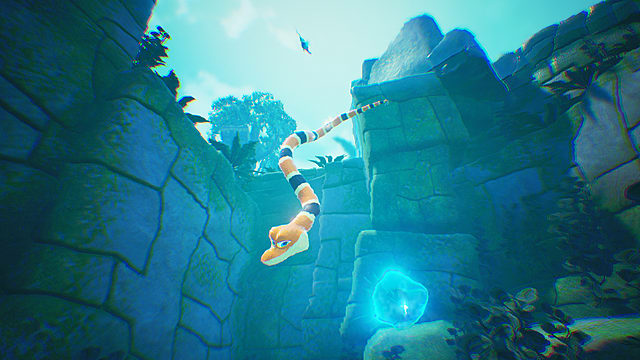 Although this game is a platformer, you won't find any jumping or running in Snake Pass. You play a snake, after all, so you must move and behave like a snake. Rather than just moving forward, you need to perfect your slither and how to change your speed. Noodles movements are so fluid and perfectly mimic those of a real snake, it's kind of uncanny. You can see that a great deal of research has gone into this element of the game. Then there is the climbing, which is an art form in itself -- and the most infuriating part of the game. To collect items in-game, you are faced with a lot of bamboo climbing frames. Using what Sumo calls "Snake Physics," you need to learn how to climb and coil by tightening and loosening your body around the bamboo. It really isn't as easy as it sounds, and you will spend a lot of time falling off and having to start a particular climb again. 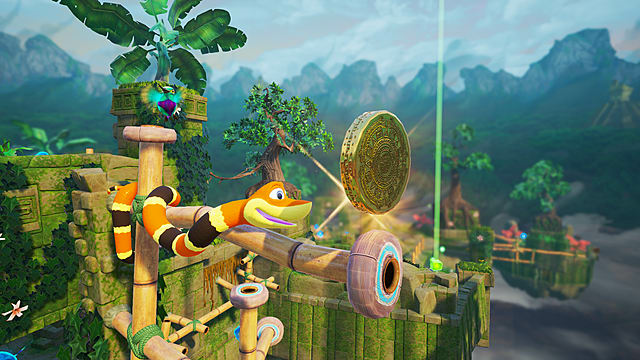 Luckily, there are no "lives" in Snake Pass, so you can start from a checkpoint as often as you fall off. In case things do appear to be going wrong, you can get Doodle the hummingbird to grab the end of your tail to help keep your balance. This, however, won't hold you up or stop you from falling off what you're climbing on. But if your back end seems to be dragging you down on an obstacle, this is a little helping hand. What's more, Doodle also acts as a little guide, showing you where you need to be heading, in case you ever get lost. As well as not having to worry about falling and using a life, the other nice thing about Snake Pass is that there are no mobs or combat in any way. You only have to concentrate on collecting and mastering how to move effectively. This is great from a parent's perspective. While some are ok with their children playing games that have some form of combat, there are others who don't let their children play games because of it. 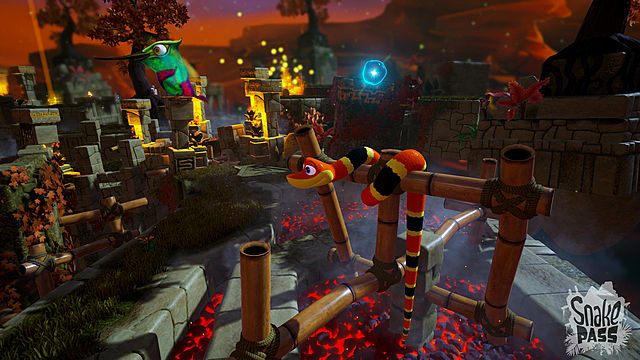 Snake Pass is purely a puzzle game. It is fantastic for helping children refine their motor and problem-solving skills. On top of that, all of the graphics are bright and, for the most part, happy, while Noodle and Doodle are very loveable and look like they wouldn't be out of place in an animated movie. Saying that, the look of the game is truly nostalgic. To some, it is pretty obvious where the developers got some of their inspiration from. But not everything in Snake Pass is so cheery. While not damning, there are some things about the game that can prove to be a nuisance. Firstly, some of the checkpoint positions seem to be a bit out of place. Having spent a while navigating a particularly hard climb, and then retrieving the gem at the top, I would have liked a checkpoint in a reasonably close location to that treasure, rather than risking a fall (which happened. It angered me. I had to put it down and come back to it ...). I guess I should be grateful that there are checkpoints at all! I can also see why the camera might not be everyone's friend. It has some really strange angles, and this is very evident in small areas or smaller rooms. The camera gets itself into an interesting position, lodged up against the wall or an object. Sometimes it zooms in completely, which makes it hard to see where you are supposed to go next. Out in the open, however, the camera can move around Noodle freely and makes for some pretty impressive views. While we can't expect a game to go on forever. Eventually, a line has to be drawn. 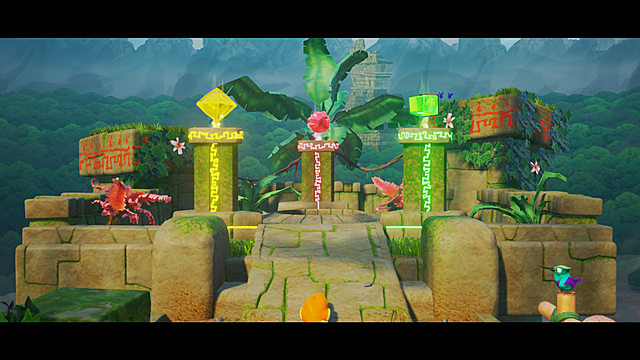 But with Snake Pass, it feels like the line was drawn too soon. 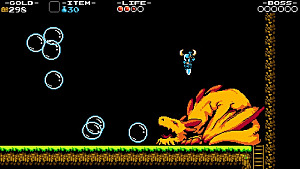 The game only consists of 15 levels across four worlds. Ok, this might be because the developers have some expansions or DLC updates hidden up their sleeves, but if you are just going to complete the main game, it might not take too long. If you are a completionist and want to collect all the orbs and coins, then it's probably going to take quite a while, so the lack of levels probably won't bother you that much. Really, it's a toss up in how you want to play the game. 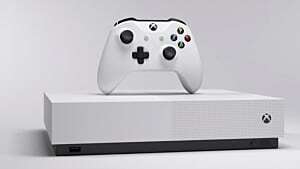 But regardless of your style, you will need to use a controller to get the most out of the game on PC. 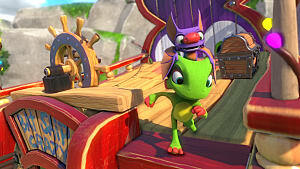 I know that not all PC gamers like to use a controller, and while Snake Pass does support keyboard and mouse, I can't really recommend it. 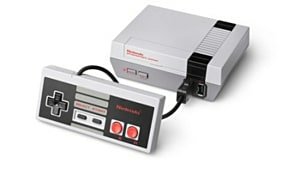 As I have reviewed this on PC, I made sure that I gave both a shot, but I just couldn't get the same fluid movements using the keyboard and mouse I could when using my controller. Don't get me wrong, it is totally possible to play it this way, but I think that it was designed to be played using a controller. 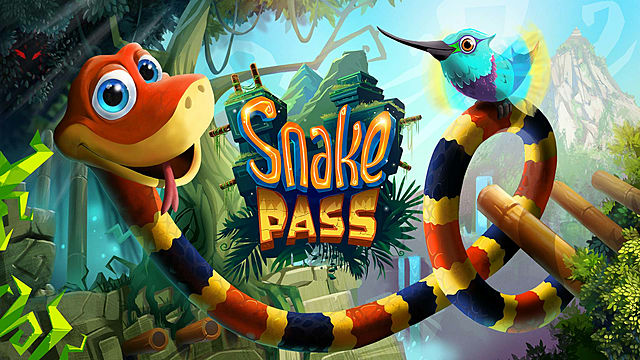 In a year when other similar looking platformers are being released, Snake Pass certainly stands on its own with its own unique gameplay mechanics and loveable characters. Even though the camera can be a bit annoying and the game itself is a bit short, it is nonetheless a great experience. For anyone who wants to try something new and just escape reality for a bit, you don't need to look any further. 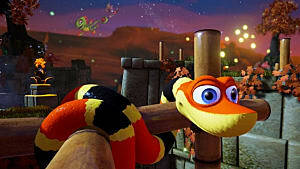 I've thoroughly enjoyed Snake Pass, as have my children, and I really hope that there are going to be more levels to come! Let's see what other adventures Noodle and Doodle have in the future! 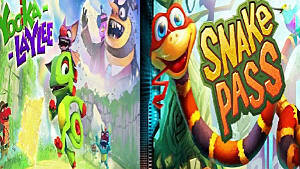 Snake Pass was provided for review by developers Sumo Digital and is currently on Steam for £15.99/19,99€/$19.99. Sumo Digital has created a platform puzzler that is equally charming and infuriating. But it's hours of fun that shouldn't be missed by fans of the genre.